A replacement mini-roller 1-pack (no handle) This is a perfect stenciling tool for smaller detail and multi-color stenciling - Dense Foam Mini-Roller. The easiest and fastest way to apply stenciled images to a wall. Perfect for multi-color stencils, allover patterns such as damask and scroll, faux frescoes and murals. Great for craft stencils, furniture projects, card making projects. We suggest having a separate roller for each color for faster stenciling. You can certainly use the same roller, but it will need to be rinsed of paint and dried before applying new color. Residual water in your roller could create seepage under the stencil. 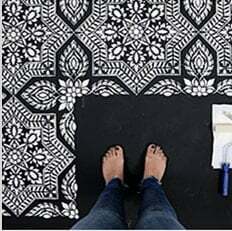 For Detailed Illustrated Instruction on stenciling with a roller, please refer to our Stenciling Videos and How to Stencil Instructions.